The Northern Hawk Owl is widely distributed through the boreal forest in both North America and Eurasia. However, in North America it remains one of the least studied bird species, in large part because breeding grounds are mostly remote, and only small numbers move south in most winters. MRF has begun research on the movements of Northern Hawk Owls as part of its northern raptors program. 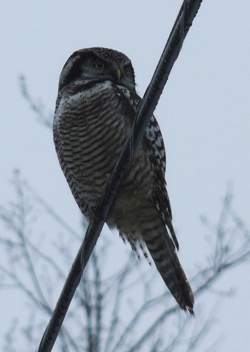 Northern Hawk Owl perched on a wire in Dorion, Quebec in winter.